This module explores what it really means to bow your brain to your heart and be a courageous, loving, humble and a "whole" teacher guiding fearlessly others. With Embodied Flow™ asana (Flow, Hatha, Yin), pranayama, chanting, visualizations, manifestation practices, philosophy, and meditation, we will gain strong foundations in the practices of Heart - Mind super potion and the core stability/support from the pancha koshas. We also study the non-dual tantric teachings on awakening, tantric cosmology and so much more. Awakening to THIS, all that there is. Full 100 hrs module includes a self-study portion after the training which includes 40h home pranayama, meditation, asana from different systems, planning classes, writing an essay of the training (and after) experience. Done in about 4 weeks. Satu has been teaching almost 20 years and is known for her very unique, otherworldly and authentic transmission. Borrowing the words of one of her students: " Satu`s classes leave you with "what the hell just happened?". Its beyond yoga, its a LIFE a LOVE a REALIZATION class”. She is an experienced yoga teacher (ERYT500) with more than 10000 teaching hours under her belt, Embodied Flow™ senior teacher, a teacher training facilitator since 8 years, Creator of Embodied Yin and Co-creator of Embodied Flow™ Yin program and a Reiki Master, soon to be a movement therapist. Read more about Satu here. We’ll be staying at one of the most beautiful retreat spaces in Denmark, ‘Mellem-rummet’ on the island of Samsø. 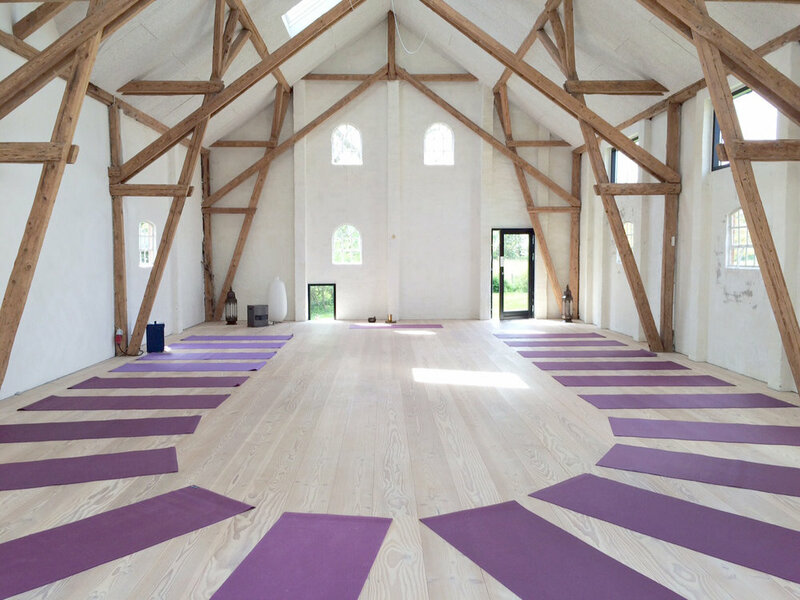 This is an old charming farm house that has been lovingly restored and the old barn has been converted into an amazing yoga space. Close to the beach and surrounded by beautiful fields. All meals are included and will be served by our caretaker. 3 vegan meals per day incl. water, tea, coffee, fruit, snacks. Read more about Mellem-rummet here. From Copenhagen / Zealand / Sweden you can take a car or bus to Kalundborg, and from there the ferry takes approx one hour to Samsø. There are several departures each day. More info here. From Jutland / Germany you can get the ferry from Hou to Samsø in about an hour and there are several departures every day. More info here. Full price is 1600€ when a 500€ non-refundable reservation fee is paid upon booking. The rest to be paid 90 days before the training starts. Full price is 1900€ when a 500€ non-refundable reservation fee is paid upon booking. The rest to be paid 90 days before the training starts.